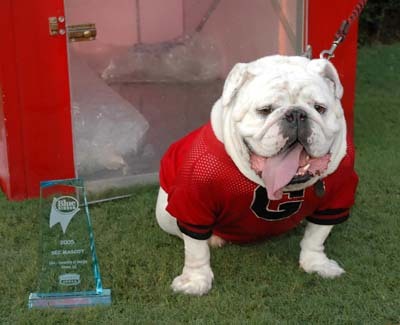 The AJC has a great story on the 50 Year Anniversary of the Uga line of mascots at Georgia. They also have a nice photo gallery up. 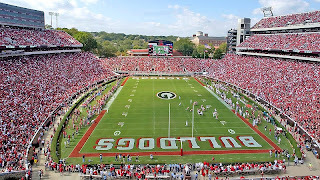 My favorite Uga story involves the 2002 GT game in Athens. A buddy of mine got drunker than Cooter Brown and tried to get his photo taken pre-game with Uga VI. One thing led to another, there was a misunderstanding, and he almost accidentally made the fatal mistake of attempting to walk off with Uga. I get the impression that the Seiler family has dealt with this before. All in good fun. In today's day and age of government intervention gone crazy, some ATF agents would've probably jumped him, confiscated Uga VI as evidence, and accussed him of being a Ninja. Hey, listen, I have no tolerance for overzealous agents of an increasingly authoritarian national government overreacting to a practically nonexistent provocation and abusing innocent Methodist sophomores due to their own atrocious misjudgments . . . but, when it comes to somebody trying to kidnap (or, I guess, dognap) Uga, I don't even think the guy's entitled to a warning shot.